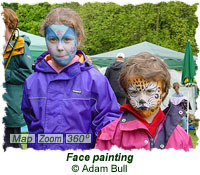 This year's annual Family Funday was a great success, despite the gloomy weather, and was attended by around 300-400 people. As always, its aim was to help raise awareness about the Valley and the Friends group, as well as provide an afternoon of fun and entertainment for all the local community. 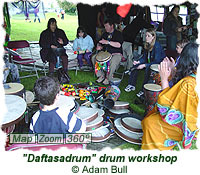 In addition to the many activities and displays on offer, three live bands provided musical entertainment and local residents brought home-made cakes and other refreshments. Building your own bird box. Creating "meadows in a pot". Making a wish for a Wishing Tree. Making "windspinners", dragonflies and suncatchers. T-shirt, hat and badge colouring. Live "pond beasts", bats and hedgehogs. 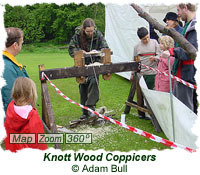 Demonstrations by Treesponsibilty and Knott Wood Coppicers. Besom broom making by the Kirkstall Ranger. 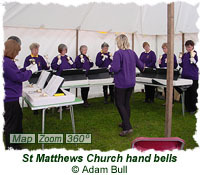 - St Matthews Church Hand-Bell Ringers. - Jazz & Blues Band. - The Port Brothers Band. - Skelton Grange Environment Centre. 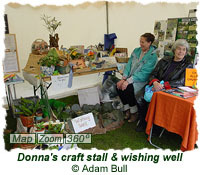 - Chapel Allerton Churchyard Group. 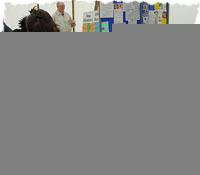 Friends of Gledhow Valley Woods Web Site display. Information about Gledhow Valley Woods & the Friends, plus Suggestions Box. 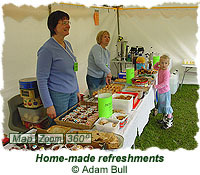 Additional cakes and refreshments donated by Tesco. 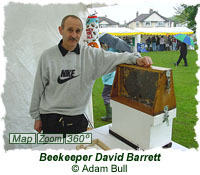 The event was only possible due to the dedication and enthusiasm of the Friends group and other members of the local community, together with the generous donations made by those attending.